Tuscany is the perfect destination for a weekend away, and here are six beautiful cities you’ll love to visit. Nestling in central Italy, and around a two hour flight from the UK, Tuscany is a perfect location for a weekend away or a longer, more relaxed break. There are seven UNESCO World Heritage sites in the region, and over 120 protected nature reserves. It is also a perfect location for a foodie break, with a local cuisine that focuses on simple but high quality produce. Local specialities include ribollita soup, ricciarelli biscuits and panforte. Wine is also a famous product of Tuscany, including well known names such as Chianti and Vino Nobile di Montepulciano. The birthplace of the Italian Renaissance was home to many of Italy’s most famous artists and scientists. And whether you opt for a city centre apartment or the glamour of a luxurious Tuscan mansion, a holiday in Tuscany has so much to offer! When you mention Tuscany, most people immediately think of Florence, the area’s capital city. 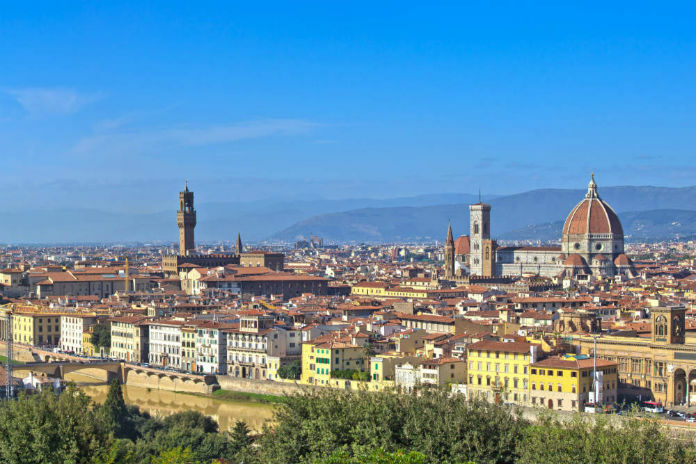 Getting to Florence is easy, as it is served by one of Tuscany’s two international airports. There is also a large national and international railway station in the city. Millions of tourists are drawn to the city’s history and beautiful architecture every year. The iconic Duomo (cathedral) with its brick dome is immediately recognisable, and the historic centre of Florence was designated a UNESCO World Heritage site in 1980. Florence has world renowned museums such as the Uffizzi and the Palazzo Pitti, housing works by artists like Michelangelo, Raphael and Titian. Michelangelo’s famous statue of David can be seen at the Galleria dell’Accademia. And if you’re a fan of opera, then you will no doubt enjoy a visit to the Teatro Communale or one of Florence’s other theatres. The Tuscan capital is also a centre for high fashion with Gucci, Pucci and Roberto Cavalli all having headquarters in the city. If you love to shop, you will definitely want to head to the high end fashion stores on the Via del Parione and Via Roma. 15 miles from Florence, at the foot of Monte Retaia, lies Prato – Tuscany’s second largest city. It is often overshadowed by Florence, but it’s a great location for a long weekend. The city has many castles, museums and other cultural monuments like the Duomo di Prato, home to many important works of art. Prato’s economy has been based on the textile industry for much of the last 600 years, so the Museo di Tessuto is a must-see when you visit Prato. And lovers of contemporary art should definitely pay a visit to the Pecci Centre. This is Tuscany’s first museum devoted to contemporary art. Prato is also a centre of the slow food movement, with many local specialities. During your visit, you must try the Biscotti di Prato – twice baked biscuits that you dip into coffee or sweet wine. And unusually for Italy, Prato also has a Chinatown. The city’s Chinese population has grown from 30 in 1988 to over 15000, so head to Via Pistoiese to take in this bustling multicultural area. Siena is one of Italy’s most popular tourist destinations, and was designated a World Heritage site in 1988. It is located in the central part of Tuscany, and is easily accessible by train from either Pisa or Florence. The main attractions in Siena are the medieval architecture and the rich history of the arts. The fan shaped central square is overlooked by a Gothic Town Hall, and the 14th century Torre del Mangia. You can climb the 400 steps to the top of this tower for a spectacular view out over Siena. As with many Italian cities, the Duomo is also very impressive, and has a stunning white and green/black marble interior. And after a day of wandering around Siena’s beautiful streets, your thoughts will surely turn to food. Luckily, Siena is famous for its cuisine, including excellent local beef, panzanella salad, and Budini di riso. This is a sweet tart filled with a vanilla-scented rice cream. The city of Lucca lies in Northern Tuscany, on a plain near the Tyrrhenian Sea. The easiest way to get there is to fly into Pisa International Airport, then simply take a 20 minute train journey to Lucca. The city centre is closed off to cars, so you may wish to rent a bike to get around easily during your stay. Lucca is famous for its renaissance era city walls. These have remained intact even as the city has grown in size over the centuries. They are now a pedestrian walkway, giving a great view of the city. It’s known as the city of 100 churches, and the architecture is certainly a good reason for visiting Lucca. For a little retail therapy, Il Fillungo is the main shopping street in the historic centre of the Lucca. From there, you can easily reach most of Lucca’s city centre including the Piazza Amfiteatro, which was built on the site of a Roman ampitheatre. And music fans may wish to time their visit around the famous Lucca Summer Festival. This takes place at the Piazza Napoleone, and has hosted a wide range of acts from Green Day to Bob Dylan. Pisa is one of Tuscany’s most famous cities, and sits on the Arno river close to the Ligurian Sea. It is served by its own International Airport, which makes it really easy to get to. Of course, Pisa is most famous for its leaning tower, which is the bell tower of the city’s cathedral. It’s free to view from the outside, or you can pay an entrance fee to take in the view from the top. That entrance fee also covers the cathedral as well. But there is much more to see in Pisa. You can explore the city’s churches, museums and several palaces, and you can cover around 2km of the city’s medieval walls on foot. Pisa doesn’t have as many big name stores as Florence, but it’s still a great place for shopping. And in the evening, the riverside area is ideal for a gentle stroll. Many of the monuments are illuminated and you’ll find plenty of bars and restaurants to visit. Livorno lies on the western coast of Tuscany, on the Ligurian Sea. Unlike many Tuscan cities, Livorno doesn’t have a quaint medieval city centre. This is because the city was purpose built as a port in the 16th Century. Livorno is around 12 miles from Pisa’s International Airport, making the city easily accessible for a weekend break. The ‘New Venice’ district is surrounded by canals, built in the style of Venice. It is home to some of Livorno’s fine architecture, and a boat trip around the canals is a fun way to explore the city. Livorno has several museums and there is a large aquarium on the seafront. And the Via Grande is a must-see if you want to indulge in some shopping. Livorno is a perfect place to enjoy a relaxed meal of seafood on the waterfront. And don’t forget to try the local speciality drink of ponce, which is made with coffee and rum. You’re definitely spoiled for choice if you’re planning a holiday in Tuscany. Which of these gorgeous cities would you like to visit?